On April 10, thousands of children with autism will be able to do something that for many of them was impossible until recently: go to the movies. They'll see How to Train Your Dragon at one of 93 "sensory-friendly" screenings in 47 cities across 30 states. The lights will dim but remain on, the volume will be lowered, the movie will start promptly at 10 a.m. with no previews, families with special dietary needs will be allowed to bring snacks from home, and if the kids yell or even stroll around the theater, no one will complain. April Autism Awareness Month marks the first anniversary of the Sensory Friendly Films program, a joint venture of AMC Entertainment and the Autism Society. 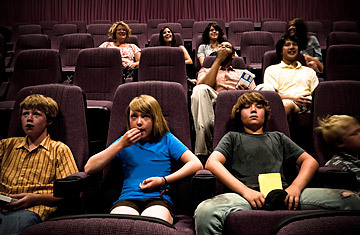 Screenings of the G- or PG-rated movies, all newly released, are held once a month on a Saturday morning. Expansion to other cities is planned. A regular at the screenings is Marianna Pollock of Virginia Beach, Va., and her 6-year-old son Xander. "We attempted a regular movie a few times," says Pollock. "We always ended up having to leave within the first 15 minutes because Xander gets so excited that he flaps and makes noise. It was very stressful." Xander's behavior at the movies is typical for many people with autism, which the Centers for Disease Control and Prevention estimates affects 1 in 110 children. "One of the challenges for people with an autism spectrum disorder is coping with strong sensory stimulation," says psychologist Sandra Harris, who runs the Douglass Developmental Disabilities Center at Rutgers University in New Brunswick, N.J. "They may be overwhelmed by loud sounds, bright lights, crowds of people. A person of any age with an ASD may flap his or her hands, twist her fingers, call out or rock when she is excited by an event such as a movie." Silvia Townsend of San Diego took her 12-year-old son Bailey to a regular movie. Once. "It was horrible," says Townsend. "He was terrified when the lights turned off. And when the loud music started, he was covering his ears and started screaming in obvious pain." Now Bailey loves attending sensory-friendly films. So does 18-year-old Matthew Kay, who has severe autism and attends the films with other young adults and the staff of the group home he lives in near San Diego. The last time Matthew was able to attend a regular movie, he was 4. The idea for the films first came about in 2007 when Marianne Ross, of Elkridge, Md., took her then 7-year-old daughter Meaghan, who has autism, to see Hairspray. Ross purposely picked an early matinee, when there would be fewer people. "Meaghan loves Zac Efron, so when he came onscreen, she just danced, twirled, flapped her hands and jumped up and down." Several patrons complained, and the manager asked the Rosses to leave. "I was so frustrated, angry and upset," recalls Ross, "because Meaghan had been so happy. I thought, There's got to be a lot of children in the same situation." The next day, Ross called her local AMC movie theater in Columbia, Md., and spoke to manager Dan Harris. She asked if he'd be willing to set up a special screening. Harris, who had never known anyone with autism, met with Ross, heard her suggestions and came up with some adaptations to make the screening more sensory-friendly to kids with the disorder. Ross put the word out about the upcoming screening through her local Autism Society chapter. "We didn't know if we'd have an empty auditorium," says Harris. "We had 300 seats, and we had to turn people away. I knew we were on to something." Harris held three more monthly screenings, then contacted AMC's national headquarters in Kansas City, Mo., where he spoke with community-relations manager Cindy Huffstickler. She thought it was a great idea and was surprised no one had thought of it before. Huffstickler then contacted the Autism Society's national headquarters, which got its chapters behind a few national test screenings that proved just as successful. "Attending a film where you know everyone in the theater is either in the same situation as you or is at least informed that the 'Silence is golden' policy doesn't apply today takes the tension away," says Angela Vandersteen of Greenwood, Ind., who takes her 5-year-old son Ray to the screenings. When Marianne Ross takes Meaghan to the movies, she also takes along her 8-year-old son Gavin, who does not have autism; he has developed a network of friends who are siblings of autistic kids at the screenings. Even families of children without autism but with other special needs, like those with physical disabilities, have started attending the screenings, citing the sense of acceptance they feel there. "Our children are constantly under scrutiny," says Xander's mother Marianna. "They look normal, so people often think they're just misbehaving. It becomes exhausting trying to validate their right to be themselves. At a sensory-friendly movie, we as a family finally get to go to a movie and relax. Boy, does that feel wonderful."